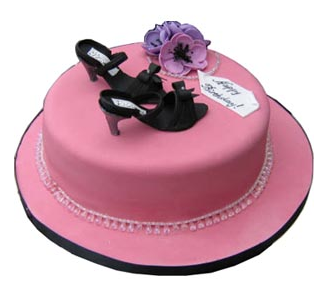 We launched Shoes of Prey on the evening of 8 October 2009 at about 8pm, so today we turn 1 year old and what an amazing year it's been! We've had over 1.6 million visits to the site with over 6 million minutes spent designing shoes, we've sent around 10,000 emails to customers, we're approaching 8,000 Facebook fans, have more than 2,000 Twitter followers and most importantly, our sales have tracked pretty much spot on the quarterly targets we set for ourselves at the start of the year. Shortly after our launch we hired Vanessa. We've experimented with taking our business offline which has lead us down the path of exploring opening a physical retail store. The business was going well enough by February that we could justify Jodie leaving her job to join us full time. We moved into our awesome digs at The Campaign Palace in Woolloomooloo. We discovered the incredible power of a 16 year old video blogger, and combining that with other social and traditional media, sales shot up. Qun joined the team in our Guangzhou office. We launched Shoes of Prey Japan. We won 3 awards at the inaugural Online Retail Industry Awards in Australia. We had what was probably our most rewarding customer experience helping Daniel propose to his girlfriend in Mexico. We launched a redesigned version of our website. And we launched Shoes of Prey Russia! We couldn't have been more thrilled with the press we've had this year either. We've been covered by Marie Claire twice in Australia and once in France, Notebook magazine twice and CLEO once in Australia, The Daily Telegraph, Sydney Morning Herald, The Courier Mail, The Times in London, The Wall Street Journal blog, Sky Business News, the Official Google Blog, along with TechCrunch, Springwise, and A Current Affair which we mentioned earlier. 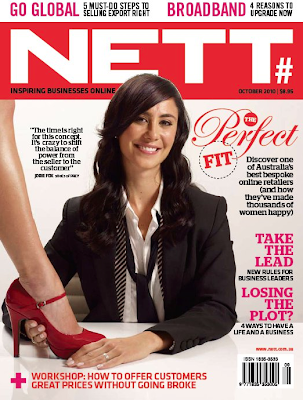 And to top it off, we're the cover story on this month's issue of NETT magazine! On a personal level it's been extremely rewarding. For Mike and I leaving Google wasn't an easy decision, nor was leaving The Campaign Palace for Jodie but starting and running our own business is something we've all always wanted to do. And to have the business running to plan at the 1 year mark is immensely satisfying. Hiring and working with Vanessa, Qun and Carmen has been a great pleasure. Seeing their dedication, passion and the enjoyment they get from helping us run the business only makes us want it to succeed more. We've also met a lot of really interesting, smart people running the business and through this blog. Our relationship with our shoe suppliers in Hong Kong and China is not only great from a business perspective, they make outstanding quality shoes, but from a personal one as well. We all look forward to our trips to Hong Kong and China to catch up with our suppliers and have learnt a lot about China and Chinese culture in the process! It's been great meeting and getting to know people at some of our other vendors like PayPal and GoGet. Renee, Sam and Brook from Swissôtel were fantastic to work with and are now good friends. Spending time with our partners Yusuke, Jun and Yuka from Japan, and Leighton from Russia (we're looking forward to meeting Olia!) has been thoroughly enjoyable. In addition to our suppliers and partners, getting to know people through this blog, and the generosity of everyone who has helped us out when we've posed problems or questions is amazing. In particular we wanted to give a shout out to some of the regular commenters like Dom, Sib, Jeni and Ian - thanks to you and to everyone else for sharing all your thoughts over the past year! And with all of that, to think the business is only a year old! In some ways the year has flown, in other ways, given all that's gone on it feels like a lot more. It's been a thoroughly enjoyable road so far and we look forward to a lot more happy birthday's to come! And if you're in Sydney next Sunday afternoon, come and join us for some birthday drinks to celebrate. And one stat you forgot! Massive congrats on an amazing achievement, and long may it prosper.